Pronation is the cause of Pain. More than 200 years of arch support / orthotic research with hundred of different patents, and probably thousands of different physicians and labs, that all manufacture custom orthotics that can change the way you walk and stand. Early researchers studied the anatomy of the foot and defined three arches; the medial longitudinal, lateral longitudinal, and transverse metatarsal arches. Most authors agreed that all three arches function together, and that the medial longitudinal arch is the primary arch. Function of the two secondary arches is directly related to the position of the the main long arch of the foot. 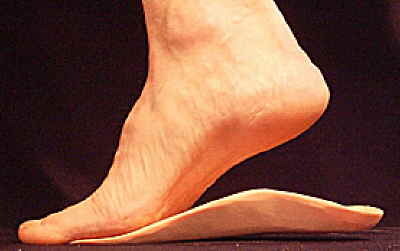 More recently, scientists who study human bio-mechanics have defined this collapse as PRONATION. This collapse of the arch during function is thought to be causative for many chronic foot, ankle, knee, hip, and back conditions. Efforts to address the collapse of the arches, pronation, and subsequent internal rotation of the lower extremity have resulted in numerable “foot control” devices that are used during walking and standing, to decrease pronation of the foot, and stop excessive internal rotation of the knee and hip joints. Hundreds of Patents exist around the world for many of the thousands of foot control products available on the internet and from physicians. Some make modifications to their basic foot control design, but virtually all authors describe the design as; a copula shaped region (corresponding with the general round shape of the heel part of the foot) that changes, beginning at the center of the heel to a contoured wedge that gradually increases to the apex, or high point of the medial longitudinal arch, and then diminishes gradually before terminating just before the metatarsal heads. Every one of more that 100 devices reviewed described the use of a wedge that contours the arch of the human foot. New research, not available from any other source.